NBN Co to get a new leader... though we don't know when. Earlier today, NBN Co chief Mike Quigley announced that he will be retiring from corporate life, and will step down from the role of CEO. After nearly four years at the head of the government-owned company rolling out the National Broadband Network (NBN), he will continue to serve as CEO until a replacement has been found. "I joined NBN Co because I believed better telecommunications was central to Australia's ongoing success. I still believe that today," he said in a statement. "The role of the next CEO will be to build on these foundations. It is now critical that we further strengthen our partnerships across the construction and telecommunications industries, as we escalate the build of the network and work closely with our retail customers to ensure a smooth migration of families and businesses to the NBN." In a joint release from Communications Minister Anthony Albanese and Finance Minister Penny Wong, they congratulated and thanked Quigley for the work he did. "Mr Quigley was instrumental in negotiating the deal with Telstra, which has paved the way for the NBN rollout," the ministers said. "Over the past four years, Mr Quigley has also successfully managed the switching on of fibre, fixed wireless and satellite connections right across the country, as NBN Co has established the full scale rollout of the National Broadband Network." The NBN Co has been faced with a tumultuous few months, with rollout delays and news of asbestos halting work, though Telstra has taken responsibility for the exposure of the substance at a number of sites. Shadow Communications Minister Malcolm Turnbull was quick to criticise Quigley's decision, tweeting: "Revolving doors at #NBN Co just as there are in the Labor caucus. How can project be a success when CEO gets fired?" Speaking to ABC 24, Turnbull also said that Quigley's retirement "will be a huge setback". "The project is leaderless. And Mr Quigley has not been pushed out because he's been doing a good job. He's been pushed out of this company because it has not succeeded in meeting its targets," Turnbull said. But in a conference call to journalists this afternoon, Quigley said that Turnbull's views about the company does not reflect his own, adding that he was not pushed out and had spoken with Former Communications Ministers Stephen Conroy previously and more recently with Albanese about his decision to retire. He explained that while there are challenges to be met by NBN Co, there is currently "no sense of crisis" within the company. In his statement, Quigley said: "My job was to lay the foundations for the NBN for the next 30 years. That job is largely complete." "NBN Co is now a well-established wholesale telecommunications company with a nationwide workforce, delivery partners, infrastructure agreements, complex IT systems and more than 40 retail customers which are supplying fast, reliable and affordable broadband to a growing number of Australians." Speaking to journalists, he said that for this reason, he felt that it was the right time for a transition. 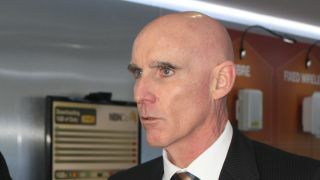 The future of the NBN policy will greatly be affected by the upcoming election, with the two major political parties having significantly different ideas for the NBN's future, but Quigley told journalists that like the current policy, there will always be policy challenges that can be looked at and worked through. NBN Co's board will be tasked with appointing a new CEO over the coming months, and has welcomed input from Quigley.